Question: Do any of our flutists have advice about playing the fourth movement of the Classical Symphony by Prokofiev? I'm an amateur flute player, doctor by trade, and have only a few weeks to master the difficult passage work in the fourth mvmt. for a concert given by our Community Orchestra. The tempo is about half =200 and I find the runs to high D very tricky as well as the famous eighth note passages traded with second flute. Not having a great deal of time to practise is a problem. Are there any fingerings or last minute "tricks" anyone can suggest? UPDATED Oct. 9th, 2017. (note: Errata corrections completed: Bar 34, eighth note, F naturals on beats 3 and 4 should have been F-sharps in both parts.) Now corrected in pdf parts and score below. Here is your biggest wish EVER, granted with tiny bells on. Full printable PDF, score and if you scroll down the pdf, separate page-turned parts for doubling piccolo on Flute 1 and 2 in the Finale of Prokofiev's Classical Symphony. This re-write, well, I must say! It's so fun to play now! Yes, you need your piccolo very close to hand (I suggest a shelf below the Manhasset) to make the switches gracefully, but that's part of the fun! Another possibility is give a half-bar to the second flute every now and then. Saves you some switches. Yes, indeedy do, the passages you're describing from Classical Symphony by Prokofiev have been some of the WORST and least playable ever written for flute in my humble opinion. I've asked around and flute professionals usually advise that they only play them after months of work, Alternate fingerings *do* play a large role too if you insist on sticking to the timbre of the flute, and work like a dawg for maybe years on end. The gnarlier flute passages have alternative fingerings, and those that work best for me are in the Baxtresser Orchestral Excerpts book. Some of the best alternate Prokofiev fingerings are here on my webpage. But, rebel with many causes, one of them being ease of mind, I vote for piccolo switching. Oh...sure the orchestra may not pay you to double on two instruments (they may not even WANT you to double, so shhhhh. ) So say nothing; just whip out those piccolos and breathe easy. You'll sound amazing, and no one will notice except by your gloriousness. So do use these parts. Please. I'm a very strong advocate for both players to play piccolo throughout the fourth mvmt. wherever possible. That's why I've created these parts for free. I believe that if Prokofiev would have heard piccolos on this while he lived he would have approved. Using flute means even excellent orchestras sound as if the flutists are screaming for help, rather than playing pianissimo and piano as indicated by Prokofiev. Also, much discussed in the past, the eighth note patterns that are exchanged between flute 1 and 2 (high Es and Gs at high speeds) have been the subject of debate whether they can be tactically re-written to make both flute parts easier in the pdf. They sound just as the composer intended. I know, because I double-tracked both parts on my Zoom recorder, and they're perfectly playable and non-changed from original intention. But gone is the pain of practising them for sixteen weeks and then having them become an inaudible blur of nighmarish bizarrity. :>) I've lived this. It is my hope that all flutists will start to use these rewrites, which will mean that these Prokofiev Classical Symphony flute excerpts will no longer be required in orchestral auditions simply because they're well nigh impossible. (We secretly suspect they are on auditions to eliminate 98% of applicants....eeek for that reality!) and instead, hopefully other excerpts will take their place that show musicality and sensible technical challenges. Let's face it; Prokofiev had no idea about those cross fingerings. So cheers to all who will breathe sighs of relief now, and please do send feedback. 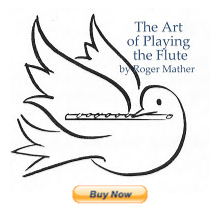 If anyone needs the original flute parts and/or score in pdf, they are free online here. Copyright in certain countries must be observed. Prokofiev's Classical Symphony is public domain in Canada. Great job. Makes much more sense than some of the suggestions for trading parts that I have seen in some articles on this work. I'm positive Prokofiev would have approved your work enthusiastically. Hope I get a crack at this work again using your rewrite...it was not great the last time with much fear and loathing. Thanks J!!!!! Feeling great about this. I could kiss you!!!!! I was stressing out about this 4th mvt ever since I got the music. What a HUGE help these re-writes are! Wow, thankYOU! Love to be able to "save the free world" in my free time. hahahhahaa. I wish I had had these re-writes when first faced with this symphony. And if I remember correctly there have been at least two stories of these types of re-writes and piccolo use in professional bigname orchestras. So go for it, and let us all know how it turns out. Thanks so much for your feedback. Love to hear a recording! Happy Scottish drams! It works. Try again, maybe your connectivity just blinked out for a second. Let me know if you continue to have trouble. Works great. Tried it three times.